Communication, information and well-being for people with disabilities; Virtual communities’ research – the perspective; Governments’ policies, legislative and telecommunications regulatory frameworks and information policy; Information needs research for people with disabilities; Deconstructing the narratives of people with physical disabilities – towards a well-being model for a successful virtual community; Findings from the narratives of the allied health/information/policy professionals – confirming the relevance of the emerging well-being model; Model construction; Future directions for virtual communities for people with physical disabilities. 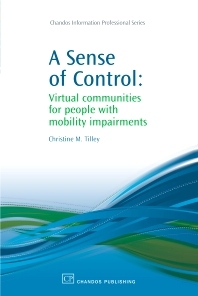 This work develops a theoretical framework for a virtual community for people with long-term, severe mobility disabilities. It proposes strategies for implementing a virtual community model based on user information needs. The central theme to emerge from their narratives is how the use of information and communications technology (ICT) allows them to regain a sense of control. The conclusion is that the technology provides strategies for independence and facilitates self-empowerment. Dr Christine Tilley is an Associate of the Queensland University of Technology (QUT), Brisbane, Australia. Furthermore, she has served as an advisor and board member on many library, information technology and disability committees. Her research work included (ICT) and disability, information literacy and information use.